Ideal for home and small office purpose, Epson EcoTank L555 is a 4-in-1 printer that supports copy, scan, and fax along with the print. With the integrated high-capacity, the printer can handle up to 70 ml of ink and print up to 6,500 pages in colour and 4,000 monochrome pages. Apart from this, the printer is supported with a 30-sheet Automatic Document Feeder (ADF) provided on the top. In addition to that, there is a single paper tray, which can hold up to 100 sheets of paper with a control panel positioned at the front of a device. EcoTank L555 measures 226 x 474 x 377 mm and weighs 6.2 kgs. It comes with a 1200 dpi copier and scanner unit in addition to a fax machine. The printer is perfect for printing photos or brochures. With the Epson iPrint3 support, one can wirelessly print anything using a smartphone or tablet. Along with this, the L555 is quick to set-up and use. It easily fills up the tank with the Epson EcoTank L555 ink supplied and its integrated ink system can save more money and time than consumed on refilling the ink cartridges. The EcoTank L555 all-in-one wireless printer is versatile in nature. It is rated at 9 ppm for printing black and 5 ppm for coloured printing of a document. Its output is similar to that obtained from other Epson printers using the conventional cartridges, which might be because of the same print heads. When comparing the cost of ink to print, EcoTank will likely to save more money and is a better choice for users that are looking to cut their printing costs. How to fix no print issue in the Epson EcoTank L555 printer? "No print" issue arises when there is a problem with the nozzles on the printhead. Power off your printer and disjoin the product’s data cable such that it is no longer connected to your computer. Load A4 size paper or letter size paper in the auto sheet feeder. Click on the Maintenance or Ink button and press the power button of your product. Now, free the power button only and when the printer takes in a sheet of paper, release the maintenance button. Your printer should now produce a nozzle check pattern. Note: When the nozzle check pattern prints correctly, it signifies that the printer hardware is fine and there is a communication problem. In case you are using the printer after a long time span, the nozzle might get clogged. Therefore, it is suggested to check for the Epson EcoTank L555 ink nozzle. In turn, this will not fire any ink onto the page. Make sure the printer driver is installed properly. Select the right type of media else it will produce inconsistent results. Use good quality Epson EcoTank L555 ink. The product you are using must be selected as the default printer. Refill the Epson EcoTank L555 ink tank, if the ink in the sub-units are expended. For Windows user, check Print Queue in the maintenance tab of the printer driver. For Mac OS X user, ensure that the printer status is not paused. To resume the printing, select system preferences from the menu. Click printer & scanner, then double-click to select your printer. At last, click Resume. How to fix the inverted image issue for Epson EcoTank L555 printer? In your printing application, turn off any mirror or inversion settings. Q. 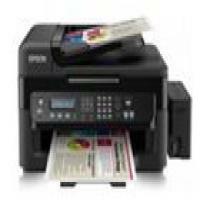 Does the Epson EcoTank L555 printer contain an Automatic Document Feeder? If yes, how many sheets can it hold? A. Yes, this printer has an Automatic Document Feeder (ADF). The ADF has a capacity of 30 sheets. Q. Can you guarantee the security of my credentials if I make payment using my debit card for the Epson EcoTank L555 ink on your website? A. If you purchase Epson EcoTank L555 ink or any other product from this website, the payment will be hosted by Sage Payments to ensure maximum security of your credit/debit card details. We guarantee that the information provided by you during the transaction will remain protected and no third party will have access to it. Q. What is the difference between an ink tank and an ink cartridge? A. Ink cartridges refer to ink containers that have an inbuilt print head whereas ink tanks do not contain an inbuilt print head and always have different ink tanks for different colours. Also, ink tanks are much easier to refill than ink cartridges. Q. What are the dimensions of the Epson EcoTank L555 printer and how much does it weigh? A. This printer has the following dimensions: 474 mm‎ (Width) x 377 mm(Depth) x 226 mm (Height). Its weight is approximately 6.2 kg. Q. Can you tell me when I should consider refilling the ink tanks of my Epson EcoTank L555? A. You can check if the ink tank needs to be refilled by visually checking the ink levels in the printer’s ink tanks. If the ink level is below the lower line on the ink tank, you need to fill it to the upper line on the ink tank. Otherwise, the LCD screen on the printer displays a message when an ink tank is low or needs to be refilled. Please note that if you keep using the printer when the ink level is below the lower line, it will damage the printer. You need to purchase Epson EcoTank L555 ink as soon as the ink levels are low.